Since we’ve found ourselves a comfortable campsite in an area that has a few things to investigate, we’ve decided to stay for another couple of nights to see out the manic four day weekend. Also, the slightly disturbing weather maps in Aujourd’hui (our French newspaper) indicate that we have a period of inverted weather whereby the south of France fares worse than the north so, for the moment at least, there seems little point going further down. 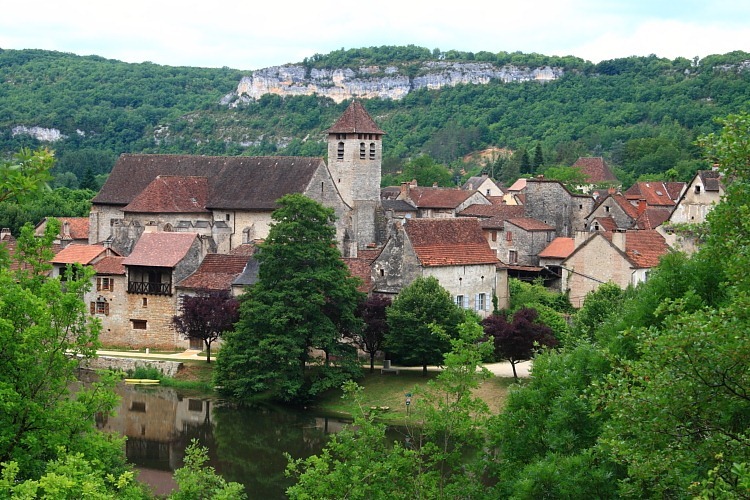 Figeac lies on the river Célé. Flowing roughly south west from Figeac through the vallée de la Célé, it eventually flows into the better known river Lot which, in turn, flows through Cahors. In a previous existence, we’d spent a little time investigating the Lot vallye and, other than St. Circq-Lapopie, had wondered why. In this life time, led by the Rough Guide on Francine’s technologically advanced Kindle, we set off to investigate the vallée de la Célé before our forecast rain arrived. First stop was the hamlet of Espagnac Sainte Eulalie where there were two surprising things. The first was mentioned in The Rough Guide: “an octagonal lantern crowning the belfry of the church”. The second, not pictured and definitely not in The Rough Guide, was an improbably large French motor caravan which had somehow been driven through the narrow street (there was only one) into the diminutive square of the hamlet where it had been “parked” across a 10% slope at a sea-faring angle healing over to starboard, with its back end blocking half the square. 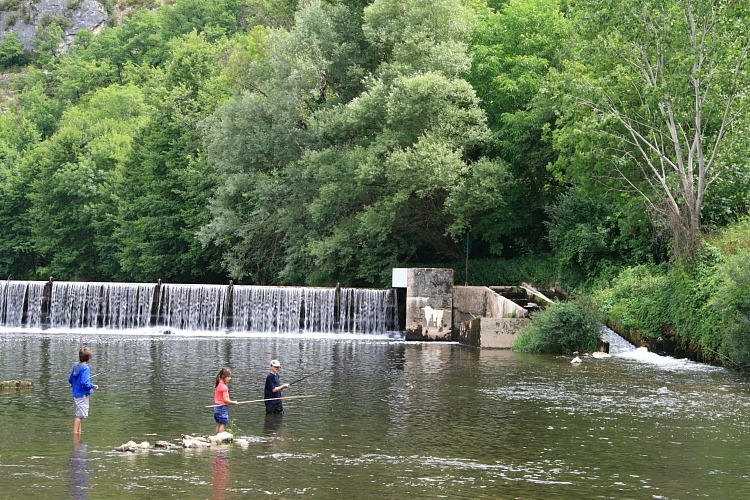 Marcilhac-sur-Célé, our next stop, provided a picturesque photo opportunity against the side of the valley together with a much more endearing French scene: three children fishing knee-deep in the Célé, armed, in the case of the young girl, with little more than a bamboo pole. Not being one to gravitate towards children, even I found this reasonably charming. 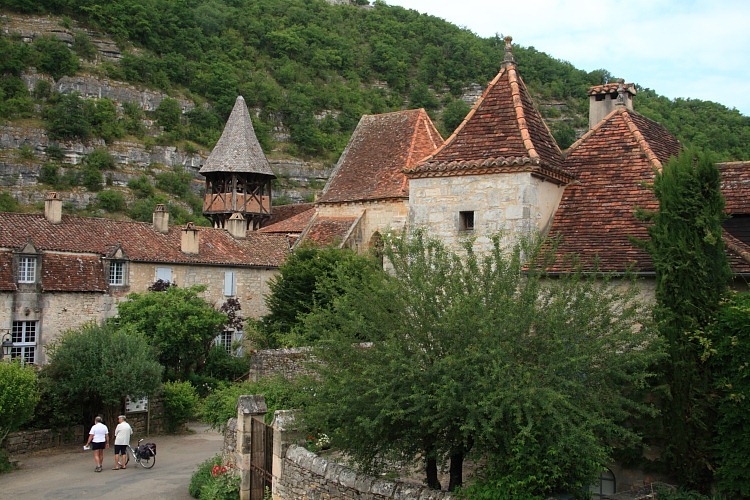 We began our return journey through the intriguingly named Cajarc [we keep transposing this into Carjac) which was, for me, the most attractive place on our day trip – a seemingly charming, typically French small town with folks enjoying street cafes, bars and restaurants. Is this mentioned in The Rough Guide? No, of course not. As with most tourist guides, The Rough Guide concerns itself mostly with things such as museums, churches and mediæval architecture. ‘T was lunch time as we began our return leg along the Lot valley and we were keeping our eyes peeled for a decent picnic site beside the river. There were none. Once again, the Lot seemed to us to be a bigger but essentially dull river that could deliver so much more than it does. St. Cirq-Lapopie is certainly worth an eyeball but that’s about it. Having failed to find a picnic spot, our picnic was back chez nous with Guillaume. We’ve had a little rain but poor ol’ France needs more – preferably after we’ve gone.